It's back and it's hotter than ever! 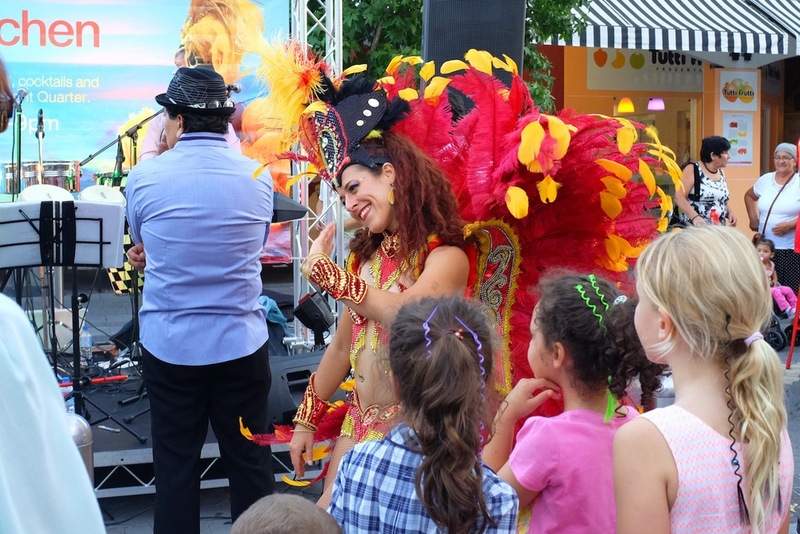 The Carnival Night Kitchen is energy packed filled with South American inspired music, food and drink. I knew I had to go and check it out especially for some good food! It was a warm still evening with the smell of anticipation all around, the crowd was emerging and before I knew it I was in a queue for some Argentine Asado while drooling over the handmade ice treats next door (which I unfortunately didn't end up sampling)..salted caramel, I will come back for you. If you love food or you're keen to engage in something fun for the whole family while shaking your booty, head on down to Claremont Quarter for a great time. The event is running for three Thursday evenings, be sure to pencil in Thursday 13th and Thursday 20th March, 2014, between 6pm and 9pm. Take me to Rio! Love the colours and vibrance of these costumes. The crowds getting excited for an energy packed evening El Asador- Argentine Asado South American style pizza BBQ Grilled Prawns and Baby Octopus La Paleta - Handmade ice treats based in Fremantle Freshly made Quesadilla Choripan from El Asador Asado from El Asador Portuguesa Pizza from Tapas Queens Live band playing Latin American/Brazilian style music Mojitos and Summer Pisco Sours...ole! What is your favourite thing about South America: Food, music or drink?